Since 1980, Shaw Nature Reserve has become a focus for native habitat management and restoration, including prescribed burning; correctly-timed field mowing; selective thinning of woodlands; judicious use of herbicides for invasive species control; plant diversity enhancement; and reconstruction of prairies and wetlands. As a result, Shaw Nature Reserve is able to offer 14 miles of hiking trails through an array of Ozark Border landscapes, including floodplain forest, dolomite glades, tallgrass prairie, oak-hickory woodlands, savannas and wetlands. Restoration of these habitats provides Shaw Nature Reserve’s visitors a uniquely varied experience of Missouri’s rich biological heritage. The goal of ecological restoration at Shaw Nature Reserve is the creation or rehabilitation of a mosaic of habitats that can support healthy populations of the maximum possible number of plant and animal species native to the St. Louis region. This will enhance the Reserve's already respected role as a refuge for the biological heritage of east-central Missouri. Protected natural areas today are small and scattered compared to land area occupied by natural ecosystems in the past. Living and non-living disturbance processes which once maintained biodiversity -- fire, storms, floods, migrating bison, even insect plagues and pathogens -- no longer function within modern fragmented nature. Habitat alteration, invasive species, extinction or endangerment of native species, predator eradication, and pollution, collectively, have the effect of replacing natural ecosystems with biologically-impoverished agricultural, urban and residential "human habitats". Through restoration activities which simulate natural disturbance processes, Shaw Nature Reserve is re-establishing and maintaining native biological diversity. Approximately half of the Reserve's 2400 acres are currently set aside as the "Native Habitats Area" and are managed to favor native biodiversity. The habitats represented include glades, prairies, wetlands, and woodlands. 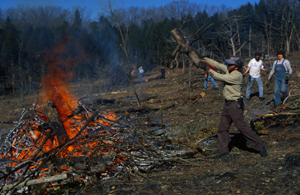 Management methods include assessment of existing diversity, control of exotic species and aggressive natives (such as Eastern Red Cedar (Juniperus virginiana)), reintroduction of native plants and occasionally animals, properly timed mowing and prescribed burning. Meet the volunteers working to restore thousands of acres of biodiversity habitat to their natural state across the Shaw Nature Reserve's diverse landscape. There were scattered earlier efforts to create patches of native prairie grass and reintroduce glade and woodland wildflowers, but Shaw Nature Reserve has been restoring native habitats in earnest since 1979. The first effort was the planting of 48 acres of prairie. Prairie restoration sites in the core of Shaw Nature Reserve now comprise over 250 acres, much of which can be viewed from the Trail House Loop Road. These are home to authentic tallgrass prairie flora and fauna like that which, two centuries ago, occupied perhaps 40% of Missouri, including much of the St. Louis region. The first “planting” of prairie hay in two small areas of our current prairie acreage was in the 1950s. The oldest of our current plantings were established in 1980. New plantings were added through the 80s and 90s up to a couple of years ago. The wetland complex encompasses about 32 acres of “swell and swale” topography along Brush Creek, reshaped in stages, in 1991, 1993 and 1996, with earth-moving equipment. The earthwork was followed by ample rains and sowing of species-rich seed mixes, along with some direct plantings of wetland flora. The wetland complex comprises seasonally flooded pools, marsh, wet prairie and moist woodlands, watered by rainfall runoff from the prairie uplands nearby. Approximately 50 acres of naturally occurring dolomite glades on the south and west slopes of Shaw Nature Reserve have been reclaimed through glade restoration from encroaching Eastern red cedars and other trees since 1991. Glades are the only native grassland type naturally occurring at Shaw Nature Reserve. 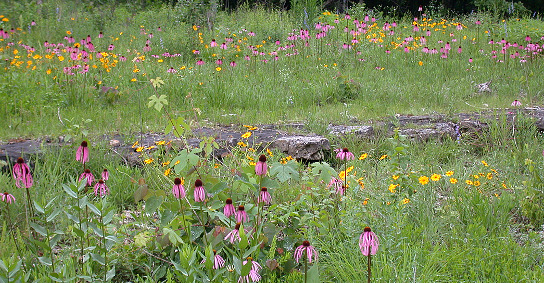 The portions in good condition are serving as natural sources of native plant and pollinator species for both glade and prairie restorations. More recently, ecological restoration, including invasive species control and prescribed burns have been applied to the woodlands. Eastern red cedar and other fire-sensitive tree species being removed from the woodlands to allow more light and air-flow, and to increase herbaceous plant diversity. Ozark woodlands were inhabited for centuries by native Americans and maintained by their "fire culture". As modern restoration progresses, selective cutting and prescribed burning have yielded an oak and hickory-dominated woodland with "orchard-like" appearance described by European settlers 150- 200 years ago. As the woodland structure becomes more open, a carpet of grasses and flowers, some of which are best adapted to growth in the dappled light of the woodlands, has flourished . The eastern red cedar rapidly colonizes and takes over recently opened-up habitats. Shaw Nature Reserve had a long history, previous to the purchase of the property by the Missouri Botanical Garden in 1925, of logging, grazing, and agriculture. The many cedars here are a sign of past ecological disturbance. With their dense, year-round shade and acidifying needle duff, cedars make the ground beneath them unsuitable for the growth of many other plant species and for the animals that depend on these plants for survival. Reducing the cedar population makes room for these other species to exist. Many attractive wildflowers that were once common at Shaw Nature Reserve became rarer as the cedar population grew in recent years. Numerous studies of early historical accounts of plant cover and of the ecological requirements of our native plants and animals show conclusively that before the Euro-American settlement, the native upland vegetation of this part of Missouri was much more open than it is today. The land was covered with a sort of prairie studded with oak and hickory trees called savanna by ecologists. Only in the moistest, most protected sites, such as river flood plains and shaded valleys, did the closed-canopy woodlands we think of as "normal" forest occur. The reason for this is directly related to human activity. The native Americans that lived here for at least 10,000 years before the arrival of settlers from Europe were truly a part of their environment. They knew the plants and animals of their surroundings well, and had learned not only how to utilize these species for food, fiber, medicine, etc., but also knew how to manage their environment to favor these species. The major management tool in "presettlement" times was annual burning. During dry spells, from late fall through early spring, the native Americans set fire to the fields and savannas, which could then spread unchecked for miles and miles. In open areas, the flames reached up to 30 feet high and rushed roaring and crackling through the tall dead grass and flower stalks. In the wooded areas, the grassy understory was shorter and didn't dry out as quickly, mulched as it was by fallen tree leaves, so the fires crept lower and more slowly across the land. In wet years, fires burned irregularly, often not even entering the shaded areas. The thinning of cedar stands at Shaw Nature Reserve during winter months is an ecological management tool which complements use of fire, and is meant to set back ecological changes set forth by the arrival of Europeans to this area in the early 1800s. The newcomers brought an end to the "fire management" of the ecosystem carried out by the earlier human settlers of this continent. The "thickening" of the woodlands and the shading and crowding out of a large number of plant species and the animals that depend upon them has necessitated the cutting of some trees and the reintroduction of controlled burning. These practices will enable us to regain the pristine beauty and biological richness of the Reserve's relatively tiny island of natural vegetation in a sea of agriculture and development. Decades of suppression of wildfire or prescribed burning permitted encroachment by trees into these formerly treeless, rocky grasslands, so cutting and removal of the primary invader, the Eastern red cedar (Juniperus virginianus), was the first tactic used. Once the cut cedars are cleared off, prescribed burning and sowing of locally collected seeds of glade species in bare areas advances the restoration process. In recent years, many of the reopened glades have sprouted up in shrubs that used to grow spindly and starved for light beneath the cedars, but now have abundant light and full access to rainfall and nutrients from slowly decomposing roots and humus created by the cedars. Prescribed fire top-kills these shrubs, but permanent removal requires the judicious use of herbicides by cut-stump or basal stem treatments, which minimize herbicide used and effects on non-target plants. Prescribed burning is an attempt to replicate the natural phenomenon of landscape-scale fire that has occurred for as long as there has been terrestrial vegetation. There is fossilized charcoal (of which the only known source is the burning of wood) dated around 300 million years old, long before the first conifers, and much less the flowering plant trees that dominate our wooded lands today, even existed. Charcoal and other remnants (ash) of past fires can be found throughout the fossil record, in glacial ice layers and in the layered muck at the bottom of lakes. The recent history of fire in Missouri has been reconstructed from a variety of sources. These range from the anecdotes and diaries of native peoples and early settlers from Europe to the scientific documentation of burn-scar patterns of living old-growth trees by Dr. Richard Guyette of the University of Missouri. Many questions remain about details of this history, but it is undisputed that fire was an important influence in determining the characteristics of the vegetation of this region. Only in the last century did fragmentation of the natural landscape and wild land fire suppression became prevalent. Paleoecologists have shown that prairies and oak savannas occurred in North America before the arrival of humans 15- or 20- thousand years ago. But, these ecosystems increased greatly in coverage and geographic extent after humans arrived and began using fire to manage vegetation characteristics in ways that favored the abundance of harvestable plant and animal products. 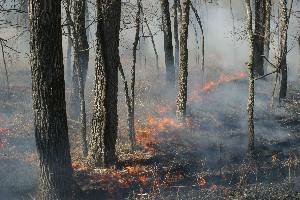 Prescribed burning has gained wide acceptance among natural area managers across the Midwest, though there is a lot of discussion going on about how best to apply its use and still conserve the full diversity of life. This is because some native plants and many native animals are notably fire-sensitive. How can these be conserved while favoring the species that benefit from fire? While the beneficial effects of fire on certain plant communities are generally accepted, there is also much concern about the loss of species in the so-called “detritus food chain”, i.e, those that live in leaf litter and dead stems and wood that is destroyed by fire. At Shaw Nature Reserve, the current approach is twofold: a) never burn more than half of all the area we have in fire management during a burn-year and b) let areas within burn units that do not burn in the first pass of the fire remain unburned to provide natural refuges within the burn unit for the sensitive species. The work of participants in a prescribed burn is quite different from the brush pile burning. There is no lugging of branches and hunks of wood to a raging bonfire. Rather, the work consists primarily of stringing out along and monitoring the edge of the burn area to make sure that the fire does not escape it’s predetermined boundaries. If there are escapes, you must quickly communicate this to the nearest staff person or take immediate action to suppress the escaped flames while calling for help. (The work of prescribed burning has been described as 95% boredom and 5% sheer panic. I would adjust this to contain a significant percentage of smoke inhalation!) Interested in participating? Become a volunteer! As described above, abundant historical, anthropological, and ecological data indicate the frequency of fire over the eons. Fire suppression has created a major need for cutting some cedar trees. Initially, all the cedar removal was carried out by Shaw Nature Reserve staff and volunteeers, but since 2004, Shaw Nature Reserve has incorporated commercial logging into the glade and woodland restoration program. Shaw Nature Reserve receives some payment for the harvested lumber and cedar mulch that are extracted, but the profit we hope to gain from this work is in the number and abundance of species that thrive in our natural preserve. 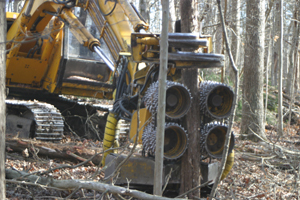 The work is closely supervised by Shaw Nature Reserve staff, with every attempt made to keep ecological disturbance to a minimum, and the logging company uses equipment that will have a minimal impact on the soil and surrounding trees while Eastern red cedar is selectively removed. Fire in the woods does kill some smaller trees, and some species not naturally a component of oak-hickory woodland. In a low intensity woodland burn of the sort conducted at Shaw Nature Reserve, most larger and even some sapling trees survive the fire. The long-term effect of repeated burning of the woods will be a more open woodland, which is a goal of our upland forest restoration. Open woodlands interspersed with grass and wildflowers were the typical vegetation reported on the ridges and upper slopes of this region when first seen by naturalists in the early 1800s. Wide spacing is the healthiest condition for an oak-hickory woodland, Missouri's prime wildlife habitat, as these trees grow best in the better lighting conditions and produce more acorns or nuts (vital wildlife food). A rich array of grasses and wildflowers grows in open woodlands and oak savanna. These plants in turn provide food, nest materials, and other necessities to many large and small animal species which cannot survive in the shadier forest. Throughout the United States, invasive plants are destroying native ecosystems and landscapes as they out-compete native plants for light, nutrients and moisture. Most of these invaders purposely were brought to the United States from other parts of the world for reasons that include ornamental value, livestock forage, erosion control, and food for wildlife. Some arrived accidentally as part of ship cargo, embedded on animals, clinging to clothing and other means. Whatever the means of entry, when these plants entered the U.S, their spread was unimpeded by natural enemies, such as grazing animals, insects, diseases, that kept them in check in their homeland. Unregulated, they spread rapidly and wreak havoc on biodiversity as they overtake landscapes that once provided shelter and food for native wildlife. Among the worst offenders are bush honeysuckle, wintercreeper, autumn olive, sweet clover, Japanese honeysuckle, purple loosestrife, garlic mustard, sericea lespedeza, Japanese hops, and Johnsongrass. The severity of infestations at Shaw Nature Reserve ranges from a few plants to acres filled with dense populations of undesirable species. Control measures that are used range from simple mechanical methods to herbicide application and use of large equipment. Herbicides used at Shaw Nature Reserve are low risk and are not apt to contaminate groundwater. They break down rapidly in the environment and have low toxicity to animals. Every year Shaw Nature Reserve staff and volunteers participate in Operation Clean Stream by picking up trash along the Meramec river section running through the property. Staff and volunteers pride themselves on the amount of trash they pick up every year and how beautiful the Shaw Nature Reserve river section has become. Since 1967, The Open Space Council for the St. Louis Region has organized Operation Clean Stream, one of the country's largest and longest running river restoration projects. The fourth weekend of every August, event volunteers take to the Meramec River and its tributaries, working to undo damage caused throughout the year by flooding, careless littering and the unlawful dumping of trash. Approximately 87% of Missouri’s wetlands have been destroyed since the first European settlers began to carve a living from the state’s woodlands, prairies and bottomland forests. In the United States a 50% loss of wetlands has occurred and currently 60,000 acres are lost annually. Wetlands are considered the most biologically diverse of all ecosystems, serving as home to a wide range of plant and animal life. However, wetlands do more than provide habitat for plants and animals in the watershed. When rivers overflow, wetlands help to absorb and slow floodwaters. This ability to control floods can alleviate property damage and loss and can even save lives. Wetlands also absorb excess nutrients, sediment, and other pollutants before they reach rivers, lakes, and other water bodies. They are great spots for fishing, canoeing, hiking, and bird-watching, and they make wonderful outdoor classrooms for people of all ages. Governmental agencies and numerous conservation organizations are working to stop the loss of wetlands. Section 404 of the Clean Water Act stipulates that there should be no-net-loss of wetlands and it directs the Army Corps of Engineers to regulate and enforce policy related to wetlands. Any construction projects or related activities that impact wetlands must be deemed unavoidable to be authorized by the Army Corps of Engineers. If impacts are considered unavoidable, compensation is required to mitigate for lost wetland functions and value. One solution for entities that impact wetlands is to buy wetland credits from an approved “wetland bank”. Shaw Nature Reserve, under the direction of the Army Corps of Engineers, is creating an 85 acre wetland mitigation bank in the flood plain of the Meramec River. The bank will contain 34 acres of wetland, a 39 acre prairie buffer and a 12 acre tree planting to widen the forested buffer along the Meramec River. Wetland and prairie seed mixes were sown in early December 2012 by Jon Wingo. Attached are the final seed mixes used. 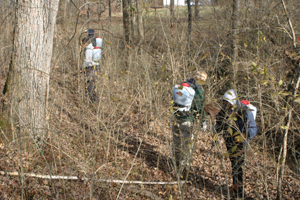 Overall, Shaw Nature Reserve staff, volunteers and Americorps collected over 400 lbs of seed between 2010-2012 at an approximate value of roughly $60,000. This was the biggest and most species rich seeding in SNR history. Congrats to everyone! The SNR bank will contain 46 credits that can be purchased by entities that need to mitigate for impacts to wetland habitat in the Meramec River watershed. The sale of credits is monitored by the Army Corps of Engineers, but the revenue generated will be used for ecological restoration activities at the Reserve. The SNR wetland bank, over a number of years, will generate approximately one million dollars of revenue. It will also provide critical wetland habitat for wildlife and other important benefits to the Meramec River watershed.